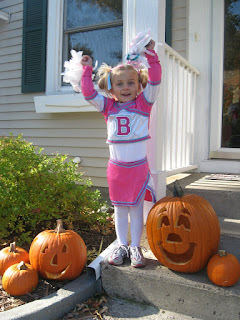 Jenna was so excited to be a cheerleader for Halloween. She and her dad went shopping for her costume. I was excited that the weather was so nice making her costume a little easier to wear without her freezing. She had a ball the entire day! 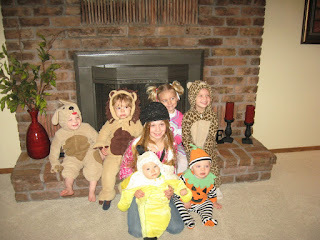 All of Dave's nieces and nephews dressed up together for a picture...quite an accomplishment. Jacob the dog, Oliver the lion, Jenna the cheerleader, Grace the leopard, Hannah as Hannah Montana, Jonas the Banana and Evan the pumpkin...Silas the pumpkin had not arrived yet. 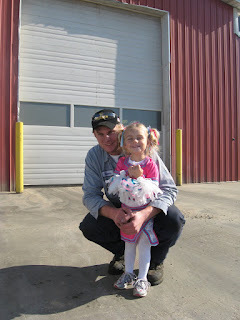 We even stopped at ZFS to see uncle Travis at work since Jenna would be at her dad's by the time he was done working. Jenna thought it was pretty special that he had a whole big bag of M&M's for her! A quick picture with Dave before we headed off for more stops. 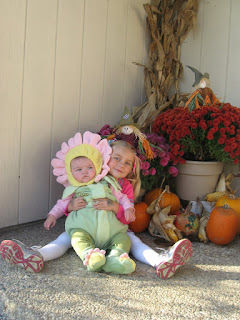 It was a busy day of visiting grandma's and great-grandparents but all worth it. 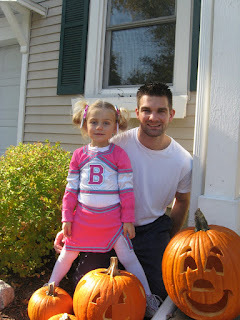 She loved trick-or-treating door to door with her dad and some friends and by all accounts had WAY too much candy to eat. 1st Snow = 1st Snowman!